Are Doctors or Hospitals Required to Provide LIVE Interpreters for Deaf Patients? | Disability Independence Group, Inc.
At least once per week, I receive a call from a Deaf person complaining that their doctor or hospital will not provide them with a sign language interpreter for their medical care. The doctor insists that the patient should communicate either by passing notes back and forth, using Video Remote Interpreters, or by trying to lip-read. At the same time, the Deaf person insists that they must have an in person, live interpreter for any and all medical interactions. The doctor or hospital insists that they have the choice, and the Deaf person insists that it is their choice. Who is right? The Answer is always effective communication! There can be no question that the exchange of information between doctor and patient is part-and-parcel of healthcare services. Thus, regardless of whether a patient ultimately receives the correct diagnosis or medically acceptable treatment, that patient has been denied the equal opportunity to participate in healthcare services whenever he or she cannot communicate medically relevant information effectively with medical staff. It is not dispositive that the patient got the same ultimate treatment that would have been obtained even if the patient were not deaf. 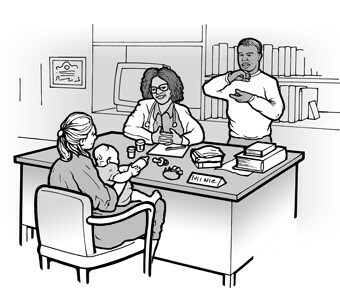 What this means is that a Deaf patient has the right to participate in his or her care to the same degree as a hearing person, including conveying and receiving medical information from doctors or other hospital. The ultimate result of the treatment does not matter as much as having the ability to understand the entire treatment. So now the question is, how does a doctor or a hospital ensure effective communication? Why is lip reading or exchanging notes often ineffective? For many persons in the Deaf population, English is not their primary language; American Sign Language is. The Deaf person’s English ability may be at the Elementary School level. Also, the majority of English speech sounds emanates from the tongue, throat, breath, so they are invisible on the lips. Approximately 70% of speech reading involves guesswork because only about 30% of English speech sounds appear on the lips. During a discussion about medical information, where the patient is usually nervous and anxious, this type of guesswork leads to misunderstandings and may place the patient in serious danger. Written notes may be acceptable for short and simple conversations, such as asking a question in a store, but not when the information is long, important, or complex. Why are Qualified Interpreters necessary? Does the Law Require Doctors to provide interpreters? Doctors’ offices located inside of a hospital are public accommodations and are required to provide auxiliary aids and services, such as an interpreter for the appointments. It also requires that the doctor provide an interpreter to a companion of a patient that the doctor would normally communicate with during the appointment. Are there any benefits for the doctor by providing interpreters? Besides the basic benefit that doctors are able to communicate with their patient and be compassionate and understanding to the Deaf patient’s needs, the Internal Revenue Service provides a “Disabled Access Tax Credit” for 50% of all amounts spent on services for the Deaf. After the first $250.00, this amount is in addition to the 50% deduction for the business expense. So if you have several Deaf patients, the tax benefit pays for the price of the interpreter. When can a Doctor decide not to provide an interpreter? Where the information conveyed is short, simple and not important. If the visit is to provide a flu shot, with not much discussion or conversation, then passing notes may be acceptable. However, if the patient has a pre-existing condition that would cause a side effect, an interpreter may be required. When can a Hospital or Doctor provide a Video Remote Interpreter? When the VRI does not work, or lags, is choppy, blurry, repeatedly disconnects, or the staff does not know how to use the VRI, then it is not effective communication. VRI is good for many situations. In some areas, it could take two or more hours to obtain an in-person interpreters for an emergency, and, without VRI, there would be only basic exchanges of notes. VRI also is useful for conversations about insurance or payment information, short exchanges of medical information, such as hospital rounds or quick questions, or other calm, straightforward, one-on-one communications. Patients with low vision who cannot accurately see the screen. Patients with an injury or procedure that impedes their ability to view the screen. For example, this includes procedures where a person is lying on their stomach, has their feet in the air, or visiting the eye doctor. Patients that cannot position their hands or arms in a location where the camera on the VRI allows the remote interpreter to adequately see what the person is signing. For example, this would include someone who has IVs in their arm(s), broken arms or hands, or is in pain when moving. Situations where there are multiple hearing persons who would be speaking. The remote interpreter may not be able to distinguish one person’s voice from another. The remote interpreter will not be able to distinguish between a doctor and your Aunt Martha. Situations where there are multiple deaf persons who are communicating with hearing medical professionals. In these situations, it may be difficult to move the VRI so multiple deaf professionals can use it. Situations that involve movement of the Deaf patient, such as physical or occupational therapy, as the VRI cannot be constantly moved. It would also be difficult placing the VRI in a location where the therapist could be viewed at the same time as the interpreter. Patients who are emotional, medicated or intoxicated, or young children who may not be able to concentrate on the screen and may not be able to keep their signing within the limited area so the VRI camera can send the image to the remote interpreter. This is similar to requesting that a hearing person who is emotional, medicated or intoxicated, or a child whisper to a doctor in order to be understood. For the same reason, if the Deaf patient is discussing sensitive issues or other emotional issues, a VRI will not be effective. How do you ask for an Interpreter? If they say no, then ask to speak to the office manager or the doctor. You need to ask everyone who has the authority to obtain an interpreter for you that you need an interpreter. If it is a doctor’s office, ask to speak to the doctor or office manager. At a hospital, ask everyone from the person who first sees you at admissions, to each nurse and doctor for an interpreter so you can understand. If they say no, say that you are deaf and you will not understand if you do not get an interpreter. Tell them that it’s your right under the ADA and provide them this article or information from the ADA website about medical information. I cannot see the VRI screen. The VRI screen is too small; I cannot understand the interpreter. The VRI machine keeps freezing and/or pixelating; I cannot understand the interpreter. The VRI interpreter cannot hear you and therefore cannot interpret. The VRI machine has disconnected too many times. It is not reliable. The personnel here do not know how to set up the VRI machine. Also, you can advise the doctor or nurse about the other issues above about why the VRI would not be effective. Who gets to choose, the doctor or the Deaf patient? So it all depends on whether the deaf person has an equal opportunity to understand and participate in his or her medical treatment and medical decisions. What do you do if the hospital refuses an interpreter or you believe a live interpreter is needed? The most important thing to do is to complain to the doctor, nurse, or other hospital staff that can provide an interpreter. If the VRI is working, use the VRI interpreter to explain to the doctor or nurse why the VRI is not effective for the treatment or service. It is not enough to just say that you do not like VRI. If no interpreter is provided, constantly complain to every doctor, nurse, and supervisor, and have your friends and family complain. What to do if the Doctor in his or her office says no? Call up the insurance company. Most insurance companies receive and administer Medicare policies, especially those that are a part of the Affordable Care Act (a/k/a Obamacare), and if they do, they are not allowed to discriminate in their programs and services under a law called Section 504 of the Rehabilitation Act. Tell them that the doctor on their plan refused to provide an interpreter and you want to see a doctor that will provide an interpreter. Mr. Lawyer, I want to sue the hospital or my doctor for not providing an interpreter!!! Anyone can sue. But, the only relief that Title III of Americans with Disabilities Act provides is to force the doctor or hospital that you would like to use in the future to provide you with an interpreter when you return. Title III of the ADA does not provide a claim for money damages. This may be different for states other than Florida where the laws provide more remedies than the ADA, such as California. Under the ADA, a doctor or hospital cannot refuse to see you if you complained or filed a suit against him, but, again, would you feel comfortable in treatment with a doctor that you are suing. If you would go back to the hospital, then it’s your right! When can I sue and receive money for discrimination. The question that is always asked of lawyers! Damages could be obtained without being required to go back to the doctor or hospital that you are suing. However, if you did not complain to the doctor, nurse or someone else that had the authority to provide an interpreter, then you will not be able to sue for damages. If you are deaf and cannot communicate in English, call up the Department of Justice ADA Information Line at 1-800-514-0301 to schedule an appointment for them to take the complaint by phone. If you file a complaint, the complaint may also be referred to the Key Bridge ADA mediation program, which will give you an opportunity to resolve the case without substantial delay.